Starleen sent the beads from my second day of lampworking class. I have to tell you that it is taking a lot of self-confidence for me to post these! Lampwork takes a lot of practice and I have very little experience. So, for the sake of showing progress (I hope), I’m posting my beginner beads. I hope that telling you why I have made certain shapes and styles will help qualify what would otherwise be horrifying beads. To those who could care less how beads are made and all the possibilities herein, you may stop reading now lest you get that glazed look in your eyes. The top row has a couple of lentil beads I made when learning how to use a bead press. There are all kinds of shapes and sizes to squish your molten glass into, and I think my first press is going to be a combo from Zoozi’s. I can’t resist a 2-for-1 bargain. 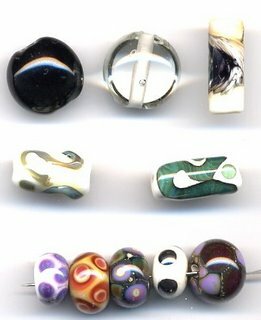 The third bead on the top row was a study on how dark ivory reacts with intense black stringer. The next row, left bead, is me practicing with a new kind of glass from Rocio that is supposed to make swirly blues and greens in a reducing (low oxygen) flame. Otherwise it’s ugly army green, and I got a lot of that. The bead to its right is a study on how turquoise transparent reacts with dark ivory to basically outline the turquoise in black. Very sharp. The third row has more studies of color reactions. The middle and far-right bead have silver foil melted in for extra sparkle and reactivity. The white bead (second from right) has dots of silver plum which gets a luster finish in a reducing flame. I torched a little in my lampwork studio tonight. I just sold a bracelet with what I call ice cube beads and, although I understood for a while how they’re made, I wanted to try it. They are annealing in the kiln, so I’ll post pictures when they’re cooled.